Before I begin, I would like to acknowledge the traditional owners of the land on which we meet today, the Wurundjeri people, and pay my respects to their elders both past and present. When I spoke to General Barry a couple of weeks ago about appropriate topics for my address today, he gave me a fairly wide brief, telling me that I could simply talk about my journey in the army or lessons I have learned along the way. In reflecting on this advice afterwards, I soon came to the conclusion that listening to a senior officer ramble on about his glorious past probably isn’t everyone’s idea of an enjoyable experience. Instead this afternoon I would like to share with you some of what I have learned about leadership and character during my nearly 30 years of service in the Australian army. In doing so, I hope that I will be able to highlight to you that, while times may change, the fundamentals of leadership that General Sir John Monash so skilfully demonstrated prior to, during and after World War I, have not. Before I go any further though, and notwithstanding my earlier promise not to recount my career in detail, I thought I might give you some idea as to how I ended up in the army in the first place, especially given that the profession of arms is not normally one chosen by young men, especially in the modern era. I left school at the end of 1987 bound for Adelaide university intent on studying economics as a pre-cursor to studying law. At the same time, I enlisted in the army reserve with the aim of becoming an officer. My reasons for doing so were threefold: first, my family has a very strong military background, with my grandfather serving in World War I, two of my uncles in World War II and another uncle serving in the Airforce during World War II and subsequently in the army as a regular soldier until after the end of the Vietnam War. When combined with Ian’s graduation from the Royal Military College six months prior to the end of my year 12, this background made joining the army seem almost natural. Second, the army reserve commitment was only part-time, which meant that I could easily fit in amongst everything else that I wanted to do and could always walk away easily if it wasn’t what I hoped it would be. Finally, and perhaps most importantly, I had developed a healthy ego at school, despite repeated unsuccessful attempts to play in the first XI and first XVIII, as well as a taste for being in charge, so to an outsider as I then was, becoming an officer seemed very attractive and very logical. My start at university was less than auspicious. My first lecture covered off on the entire year 12 economics syllabus, in which I had been quite successful, within 30 mins. After this the lecturer quickly moved to a consideration of graphs and charts, an understanding of which was essential but which were, as a mathematically challenged humanities devotee, beyond my powers of comprehension. After persevering for about two months, I soon came to the conclusion that economics wasn’t for me and took the rest of the year off to work full time as a gardener at a nursing home, which was one of a number run by eldercare incorporated, of which my father was then CEO. I returned to university the following year having enrolled in a bachelor of arts majoring in English with the hope that, by playing to my strongest suit of humanities, I would understand enough of the syllabus and enjoy university sufficiently to get the marks necessary to be admitted to the law program. However, by mid 1989 I was halfway into my officer training in the Army Reserve, finding that was thoroughly enjoying army life and that I was naturally suited to it. During the early part of 1989 I had struck up a close friendship with my now wife Selena which, by mid year, had blossomed into a great romance. Selena, who was also a member of the Army Reserve, was quick to see my potential as a regular army officer and her encouragement, together with the success and enjoyment that I was experiencing with my reserve service, saw me quit university at the end of the first semester in 1989 and eventually apply to enlist in the regular army as an officer in mid 1990, six months after I had graduated from my army reserve officer training. I spent the 18 months between leaving university and entering the army working full time as an assistant nurse at the same nursing home at which I was a gardener, eventually working almost exclusively with dementia patients. Although I admit that this was about as far from most people’s idea of service in the army as you could get, the experience taught me an enormous amount about hard work, humility, compassion and the need to listen to and respect other people. Because of my status as an Army Reserve officer, I was asked, following my success at the Army Officer Selection Board, if I would be interested in attending the officer cadet school of New Zealand rather than the Royal Military College. At the time, this appeared a very attractive option; the course was only 12 months long as opposed to 18 months at Duntroon and it meant that I would get a trip to New Zealand in the bargain. The down side was that, having only recently become engaged, I would be leaving Selena behind in Australia. However, in a decision that came to epitomise her unfailing loyalty and support to me throughout my career, Selena chose to quit her job in Adelaide and move across to new Zealand to support me during my training. The training at OCS was very intense. The NZ Army is heavily influenced by the experiences of the 2nd NZ expeditionary force, which suffered through the withdrawal from Greece and on Crete, during which it was almost continuously in contact with a German force that held absolute superiority in the air and on the ground. The training philosophy at OCS was therefore based on the principle that even when the men are dead on their feet, the officers can never stop. Training in the military ethic was a major feature of the course. The commandant of the school lectured us regularly on the habitual pursuit of excellence, honesty, integrity, moral and physical courage and loyalty. The physical and field training were also tough, made all the more so by the unforgiving terrain in the Waiouru training area and the long and very cold winters, which would see regular snowfalls, usually apparently deliberately timed to coincide with field training exercises. The small size of each class also meant that there was nowhere to hide. This differed from Duntroon, where there were generally up to five times as many cadets in each class, making it impossible to rotate everyone through assessed command appointments. This was certainly not the case at OCS, where you could expect to rotate multiple times through multiple command and leadership appointments, during which your every move and word were observed, written down and subsequently analysed. Despite the challenges of OCS, my sanity and my engagement to Selena survived intact and we returned home soon after my graduation as a lieutenant into the Royal Australian Infantry Corps in December 1992. We were married four weeks later and then headed to Townsville and the start of a very different life than that which I had anticipated when I first left school. Since then, my career has seen us posted to Townsville four times, Canberra four times, New Zealand for a second time (this time with the boot on the other foot as the Australian Officer Exchange Instructor at OCS), Ballarat, Sydney and Melbourne. As a family we have lived in 18 houses, our son Campbell, who was born in 1993, attended seven different schools and our daughter Laura, who was born in 1995, five schools. Selena has held countless different jobs, completed a range of different university and TAFE courses, co-owned an art studio and been awarded the national vocational student of the year amongst many other highlights along the way. In addition, like so many other military families, we have never lived close to grandparents or other family members, so our army family has always been our support network. My career has also given me the very great privilege and enormous responsibility of commanding Australian soldiers at every level from platoon (numbering about 30 soldiers), to formation (numbering about 3000) both on operations and at home. I have also had the opportunity to serve alongside soldiers from a variety of other nations including the United States, Great Britain, New Zealand, Singapore, Malaysia, Papua New Guinea and Slovakia and been given the great privilege of undertaking far reaching work on the future of the Army. Much of my work has probably been similar in style to that of many other professions – sitting behind a desk writing or clearing documents and attending and/or chairing meetings. Other parts of my work though are like nothing most other people in the community will ever do – weapons training and shooting, field exercises, battle fitness training and deploying on operations where the risk to life and limb is ever present, but for which you are superbly trained and prepared. There are two other unique things about service in the military. First, you are expected, from day one, to exercise leadership on a daily basis both on and off duty; this is a responsibility that I take very seriously. Second, my service has given me the chance to lead and work alongside some of the best people that this nation has to offer, all the while learning far more from them about humility, leadership, selflessness and self-sacrifice than I could ever have hoped. Indeed, if asked what it has been that has kept me in the army all these years, despite some very challenging times, it has been the quality of the people I have served with. There is something truly unique and special about going to work every day alongside people who, almost to a man or woman, can be relied upon to tell you the truth, do what they say they will do and do their work to the absolute best of their ability at all times, not because of any hope of personal reward, but simply because that is what service to the nation means. During my time in the army, I have also learned many things about leadership. Some of these things I have learned by doing (and often failing) and others from watching and working directly for some of the finest leaders in the nation including General Sir Peter Cosgrove, the current chief of Army Lieutenant General Angus Campbell and the former Queensland flood task force commander and forces commander Australia Major General Mick Slater (retired). I have also studied leadership during countless training courses, as well as at university (this time with much greater success than in my first attempt at tertiary studies). My experiences and training have taught me four key things about leadership. First, to be a successful leader you must have an unambiguous vision or aim that you can clearly articulate and that others can identify with. Once you have this aim, everything else you do must be subordinated to it if you are to bring your team willingly along for the ride. Second, leadership is a verb not a noun. This means that you cannot be a successful leader by simply studying the theory of leadership and the principles underpinning it or by occupying designated leadership positions; leadership success requires you to act as a leader and seek to influence others, all the while learning from your mistakes and seeking to study your own and other’s leadership styles in order to improve. Third, leadership is actually about the people you purport to lead, not yourself. Although there are innumerable definitions of leadership, the majority have at their heart a focus on influencing others to achieve goals. You therefore simply cannot lead successfully unless you make your team and their success the focus of your efforts. To this end, I am a great believer in Robert Greenleaf’s principle of servant leadership, which emphasises the role of the leader as coach and mentor and focusses on skills such as listening, empathy, healing, awareness, persuasion, conceptualisation, foresight, stewardship, commitment to the growth of people, and building community. Finally, and most importantly, the foundation of success as a leader is character. This includes having the moral courage to do the right thing as opposed to doing things right, admitting mistakes and a willingness to take the advice of others. It also includes sound personal behaviour, honesty and integrity, a refusal to ask others to do what you are not prepared to do yourself, reliability and humility. The development and enhancement of character is not easy. It requires the constant exercise of self-leadership through self-discipline, the seeking out of additional responsibility and a focus on influencing others positively via personal example and attitude. It also requires you to be a good team member by always putting the organisation ahead of yourself, being loyal to the organisation’s leadership and being personally accountable for yourself and your role. Finally, it requires you to consistently take a long hard look at yourself and be brutally honest about what you have done and how you can do better. It has taken me many years of military service and some very hard lessons in some very difficult circumstances to discover these things. In saying this, I am not suggesting for one minute that I have reached some type of leadership and character Nirvana – I am well short of that, although I do constantly strive to achieve it. It is worth noting though that I have, in the years since I left school, come to realise that there is very little of that which I have learned in my service that I did not already know before I commenced it. Indeed, the seeds of success as a leader in my military career were sown both at home and during my five years of secondary schooling at Prince Alfred College in Adelaide, of which I am a very proud alumnus; the army simply helped me to discover and refine my character and gave me the skills and opportunities to become a genuine leader. For this reason, I firmly believe that we must invest heavily in the development of the character and leadership skills of our young men and women when they are at school, as it is during this stage of their life that they form the habits of a lifetime. There is of course little new in what I have said today about leadership and character, except maybe as it relates to my own experience. Indeed, I would like to think that much of what I have said would resonate with Sir John Monash and the many outstanding military leaders that this nation has produced since his time. This is because, as I said at the outset, while times may change, the fundamentals of leadership do not; it is still an intensely personal process, focussed on people and helping them to be the best that they can be. In closing, I would like to thank you for the enormous privilege of speaking to you today. General Sir John Monash is deservedly revered as one of the finest leaders that this nation has produced. He was the father of modern combined arms warfare, a hugely influential figure and a man of great character. We should all be very proud that our nation produced such a leader and hold him up as an exemplar for future generations. BRIG Smith had a slightly unusual start to his military career. Born in Adelaide, educated at Prince Alfred College, he joined the Army Reserve for a short period, before entering the Australian Regular Army in 1991, where he was selected to attend the New Zealand Officer Cadet School of on exchange from our Royal Military College. David graduated into the Royal Australian Infantry. He then served in a range of regimental postings and interesting staff appointments, including going back to New Zealand as an Instructor at their Officer Cadet School. He served as a Company Commander with the 2nd Royal Australian Regiment and eventually ended up as Commanding Officer in 2008. Just before that he served as the Chief of Army's secondee to the Department of Prime Minister and Cabinet in the National Security Division. 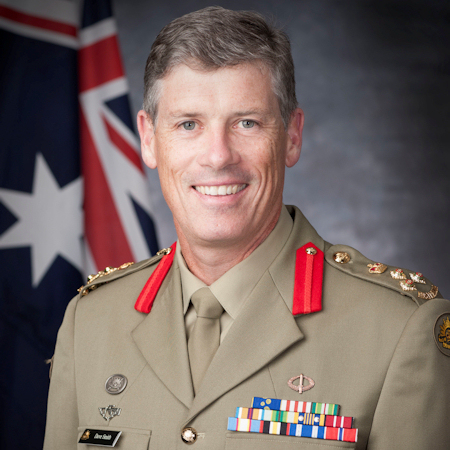 BRIG Smith has seen operational service in East Timor in 2001/2, the Solomon Islands in 2003, Timor Leste 2006 and 2009/10, and Afghanistan 2011/12 as Deputy Commander Combined Team-Uruzgan for Australian Task Force Rotation 9. He has a Bachelor of Arts, Master of Management (Defence Studies) and a Master of Leadership.